These stuffed olives lightly fried in olive oil are likely to drive your guests wild. 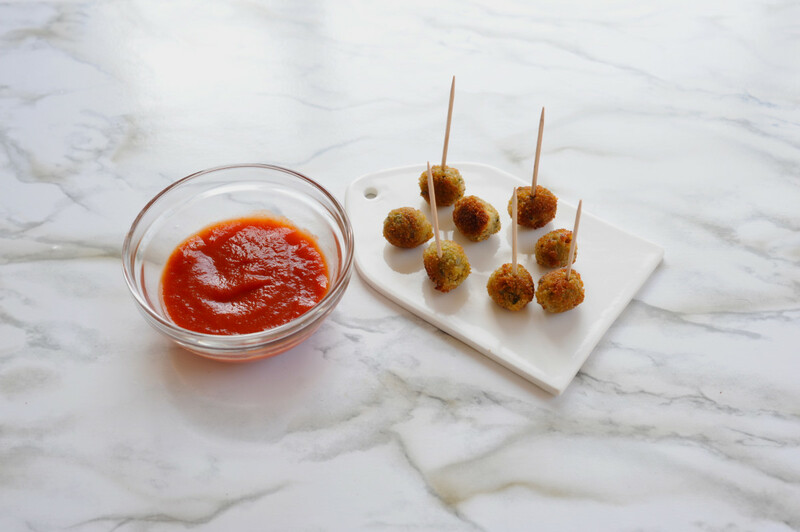 Homemade tomato sauce makes a tangy and sweet dip to balance the fried cheesy olives. 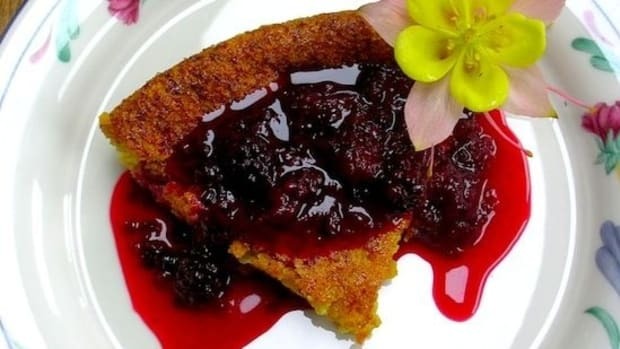 Do you ever find yourself associating people with certain memorable dishes? Do you remember a co-worker from your last job for their incredible gluten-free brownies? Or a college roommate for their bolognese? 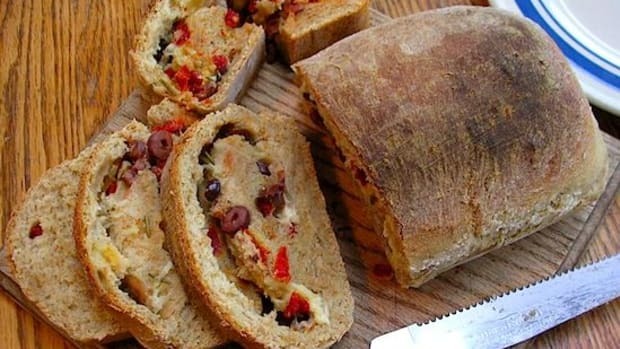 With this fried and stuffed olive recipe under your belt you are about to become famous amongst your friends. 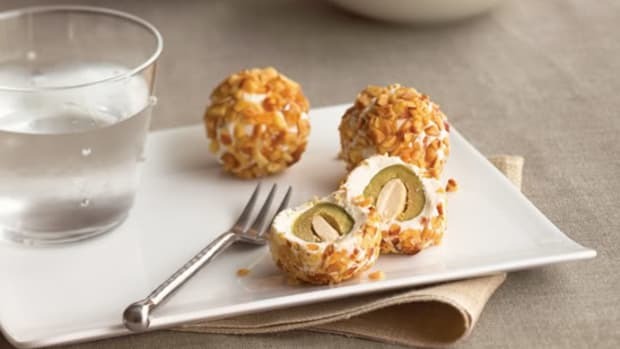 With a bit of prep work, this appetizer can be thrown together in a few minutes, but make sure to make a lot, it&apos;s likely that your guests won&apos;t be able to stop themselves from eating 30 of these delicious morsels. 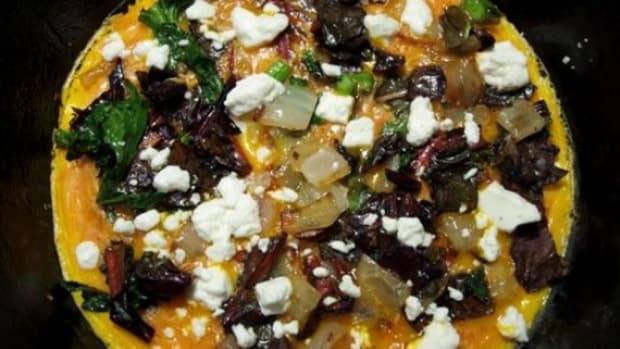 The secret to the success of this dish is keeping the goat cheese at the right temperature. You&apos;ll want to bring the cheese to a soft consistency at room temperature before you stuff the olives, but you&apos;ll want to firm it right back up in the fridge before frying. You can use any jarred or canned marinara sauce but I find the sweetness of basic tomato sauce simmered with onion and garlic to be unbeatable. First make the tomato sauce by combining the sauce, onion and garlic in a small sauce pan. Bring to a boil over medium heat and then simmer for twenty minutes, stirring occasionally. Salt to taste. To stuff the olives, carefully spoon the goat cheese into one corner of a Ziplock bag. Cut off the corner very carefully, removing as little plastic as you can. 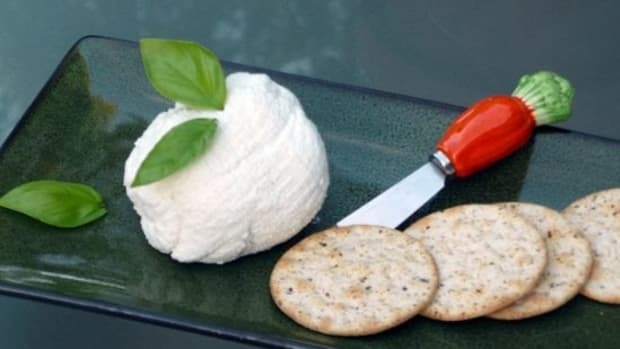 The idea is to be able to control the flow of goat cheese carefully. 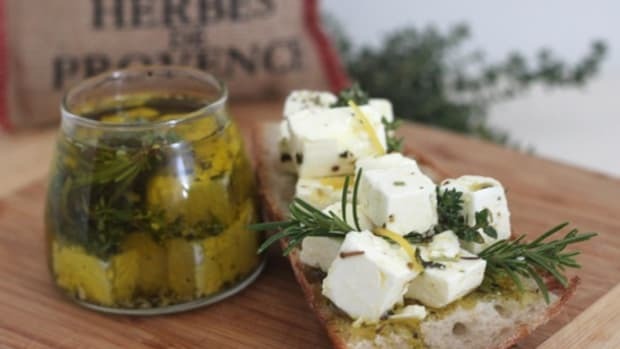 Pipe the goat cheese into each olive individually. 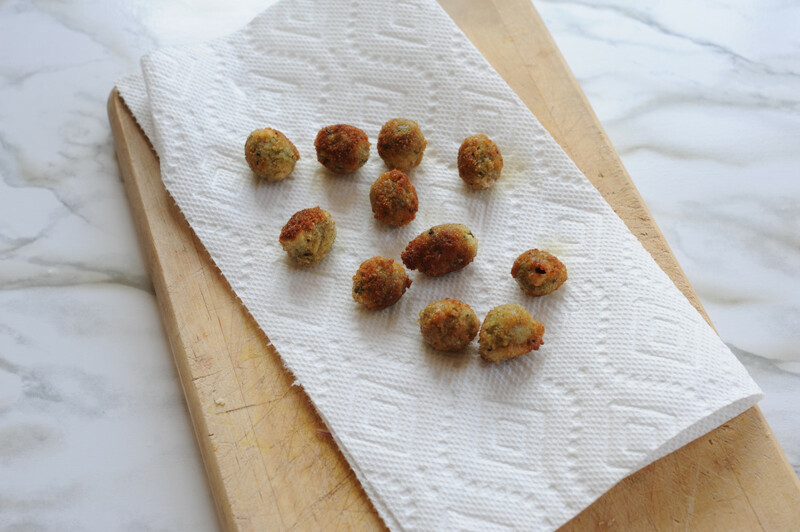 Refrigerate stuffed olives until you are ready to fry them (up to one day). Set up your frying pan and breading station so you can work quickly in small batches. Place the bread crumbs, flour and egg in separate bowls. 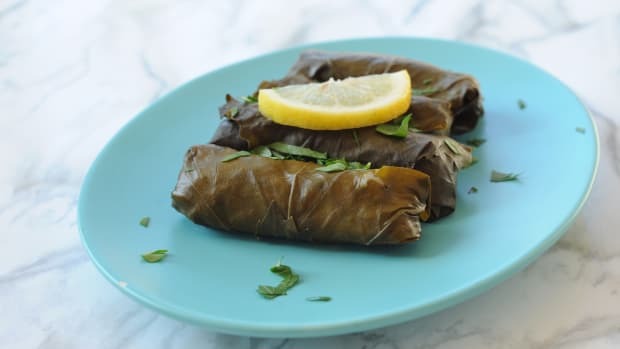 Have a paper towel-lined plate ready to drain the olives after frying. Heat the olive oil in a small non-stick pan over medium-high heat. 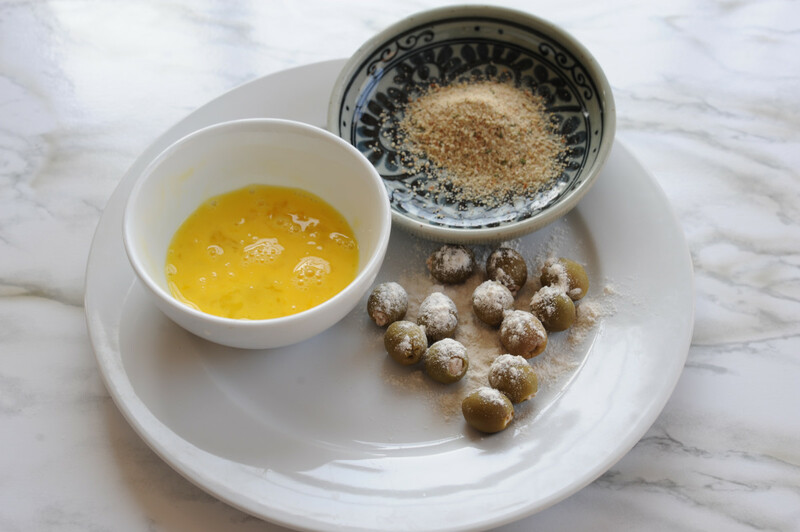 Working in batches of 5 at a time, roll the olives in the flour first, then the egg and the the breadcrumbs and drop carefully into the hot oil. Shake the pan a pit so the olives cook evenly and turn down the heat if the pan begins to smoke. 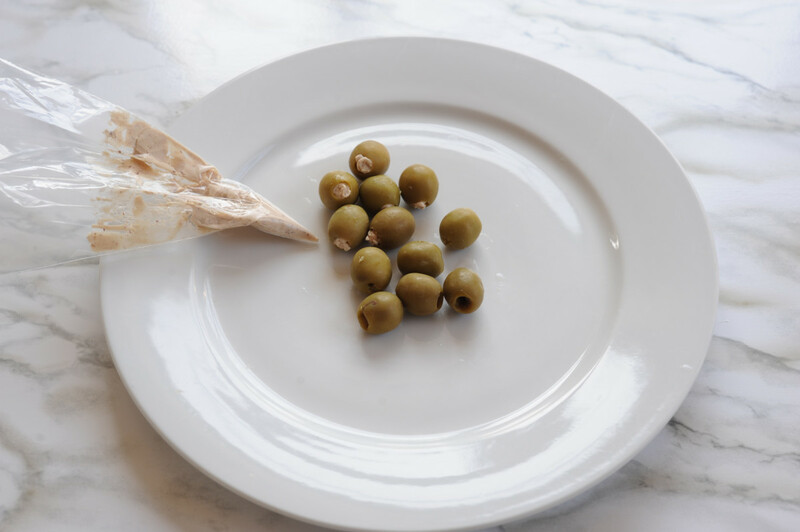 Cook the olives for about 90 seconds so they are evenly browned. 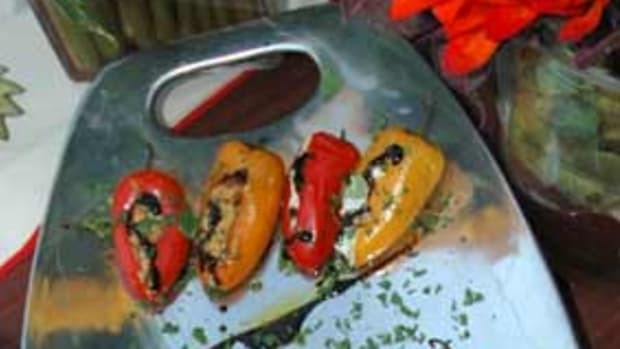 Remove to plate to drain with tongs or a slotted spoon and repeat. Salt to taste and serve with the tomato sauce.